Take a look at the furniture, art, and projects that I have completed in the past. Read about projects, follow their construction, and keep track of what I am working on. Artist statement, biography, and all that stuff. Mediasinum is a curved front liquor cabinet with two doors, lower interior drawer for storage, and upper interior shelf for old fashioned tumblers. Woods used include: sipo (top, bottom, feet), spalted sycamore (exterior doors and rear panels), curly birch (interior doors, panels, and shelves), cherry (drawer sides), Spanish cedar (drawer bottom), boxwood (drawer pull), mahogany (exterior rear spine), maple (interior spine). Interior and exterior surfaces finished with shellac. The Channel Master 6511 AM receiver graced table tops across the United States in the 1960s. This reinterpretation in quarter-sawn mahogany breathes new life into the classic mid-century form. 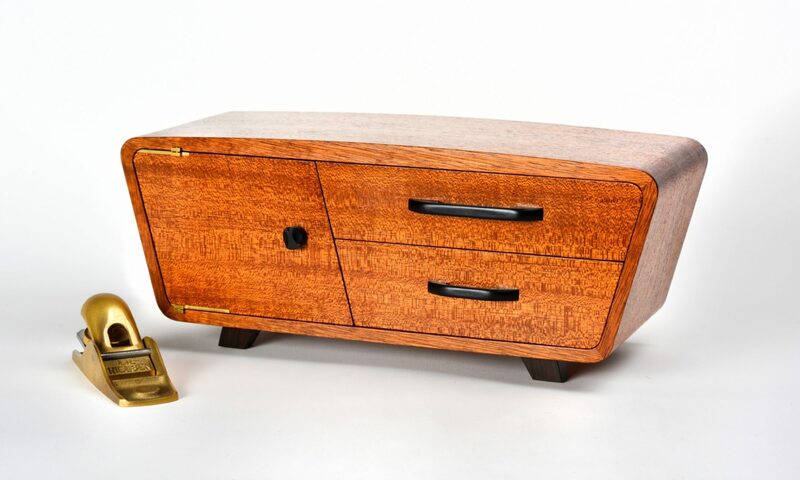 This acacia and cypress cabinet is a reinterpretation of the Truetone D-2210 AM receiver that was designed by Walter Dorwin Teague and produced in 1940 by the Western Auto Supply Company in Kansas City. The cabinet replaces the radio dial and speaker grille with a small display case and concealed set of three swing out drawers.